We aim to inspire children to want to give back to their community. We realize this goal through the Baco/Che-Na-Wah Bazaar Foundation with our summer special event, the Baco/Che-Na-Wah Bazaar. One of every summer’s highlights, the Bazaar is a special day devoted to fun, games and fundraising. 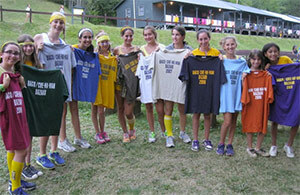 Campers help to raise funds that are distributed to dozens of charities focusing on children and needy individuals. In 2012, we proudly raised and distributed over $50,000 to more than 60 charities. Along with the fun, our campers never lose sight of the Bazaar Foundation’s purpose, to help those who need it most. We’ve been helping the needy since our camps’ founding. It’s a lesson that stays with the campers throughout the year. For more information about the Baco/Che-Na-Wah Bazaar Foundation, or to make a donation, please contact Allison Wortman allison@campbaco.com. We thank you for your generous support.